MA’s Family & Cosmetic Dentistry (Alexandria) - Book Appointment Online! MA’s Family & Cosmetic dentistry is a state-of-the-art dental office whose practice philosophy is based on Dr. Janice Isabella E. Dionisio's ongoing passion to provide compassionate, personalized care in a comfortable environment while using the latest in digital technology and the highest quality dental materials for the patients' greatest benefit. From the open floor plan that maximizes natural light and the calming interior design of the office to the excellence in customer service provided by all team members & the doctors' attention to detail, rest assured that you will receive excellent dental care in an enjoyable environment. Dr. Janice Isabella Dionisio and Dr. Carla M. Zamora Rojas are currently welcoming new patients and are providers with most PPO dental insurance plans. 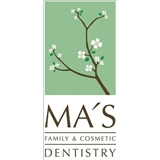 The team at MA's Family and Cosmetic dentistry would love to meet you! It was a great experience. They were very helpful, had a great attitude, and showed how knowledgeable they were. Definitely will recommend them to friends and family! As much as a trip to the dentist can be a pleasure....a visit to Dr Dionisio is always a pleasure. It is a well run office and everyone associated with the office is professional and very nice to deal with.